Through landscape and mark making, I previously tended to a process that burgeoned sets of abstract symbols. I turned the process on its head in 2001 by taking an array of signs and symbols from the actual world as a starting point to build new images. My work began to see its objects slowly, taken over by their symbolic representations and the influences of a commercialised world; the idea of landscape and the environment as a shared space could no longer be ignored. In a Post Pop time of mass, industry, culture, and modularisation, my own obsessive tendencies merged with a continuing study into the traditions of Romanticism. My drawings evolved with a growing lexicon of public and sub-cultural signs and symbols, leading me to look at maps and their keys. I began to invent my own, creating fictitious lands as well as real places in my life. The vastness of information on these drawings was to enrich my growing fascination with the intricacies and the contradictions of our world. After producing a map of the UK and Ireland I came to the decision that I would make one of London. With an ingrown passion for the city as a native Londoner, I began this undertaking in 2006; it was to span over two years. London is one of the great living palimpsests of our time. Its layers of history and constant energy to re-invent itself fuel this vast grey magnet. I was spurred on by the great Map Makers of London’s past – John Roque, Greenwood and Phyllis Pearsall (the originator of the A-Z). Informed by my own insights and knowledge, I combined further research on the Internet and through writers such as Peter Ackroyd and Ian Sinclair. 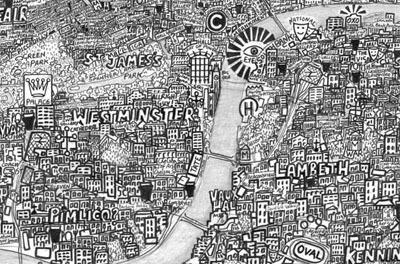 The resulting map, a spoof of historical ones of old, would challenge the first impressions of its viewer, touching on the Capital’s vastness, its secrets and its undercurrents. With this process in mind, I began to edit the information, keeping what I felt were historically important, interesting, relevant and amusing. These fantastical additions and epithets are purposefully innocent and acidic, trivial and serious. The Map is as much about the personality of its viewer as it is about my own. In other words it acts as a mirror. 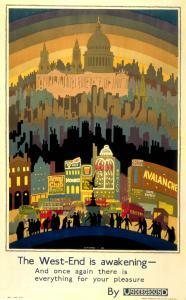 Britain is a collection of islands and this undoubtedly forms part of our identity. This provincialism at the centre of many industries, in particular the London-centric Art world, and its rise again to world city status, add to London’s identity as an icon, separated from the rest of the country. I wanted to perceive London as another one of these ‘islands,’ and so when mapping the coastline around its Borough edges I was happy to discover Carshalton Beaches coinciding with this border. It is the facts and perceptions of this study placed within reality that gives this piece such meaning to me. 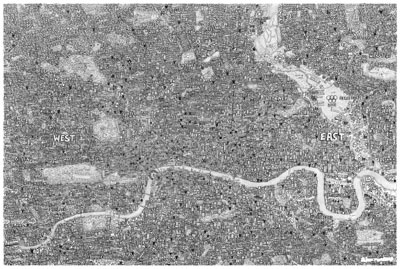 Apart from its coastline, ‘The Island’ is geographically accurate and to scale, highlighting many of London’s main roads, railways, built up areas and its green spaces. It notes the city’s Victorian legacy, snippets of trivia, local knowledge, stereotypes, its place name histories and personal facts and opinions. Discoveries such as the 1st Earl of Salisbury having honeymooned, in 1589, in what is now a dodgy part of Edmonton caused much amusement, whilst also being of incredible interest in the finding out of how places have changed. Some facts from Wikipedia are blatantly untrue. However, the inclusion of some serves as a reminder that reputations and hype can often precede facts and figures that are themselves selective in their very nature. They can often be more poignancy in ‘the everyday’ than official knowledge and statistics. For this reason, the map constantly bounces between elements of folk and conservative cultures. Other epithets include: where Winston Churchill went to school and the fact that Screaming Lord Sutch and Byron were both Harrow boys; The Gymnasium where Arnold Schwarzenegger trained; the site where the speed of sound was first recorded; the place where Oliver Twist was taught to thieve; and where Hendrix died. It notes the sights of old Palaces; Newgate Prison from which the convicted were marched off to be hung at the Tyburn Tree (now Speakers Corner); and Pimlico Prison where prisoners were shipped off to Australia, just down the road from Whitehall previously known ‘Tothill’ and ‘the thorny Island’ by its former Druid occupiers. It gives local jargons, notes the Magna Carta Island at Runneymede and the main encampments of the peasants’ revolts. These aspects have culminated into a study of ‘Our History,’ a celebration of place and an extreme form of drawing where the original requires the use of a magnifying glass in order to read it.